Around £10,000 worth of damage has been caused to vehicles which were targeted by a key-wielding vandal in a “reckless act of vandalism”. Mark Edginton's garage, on Alcester Road, near Wythall, Worcestershire, was targeted in the attack last Thursday. 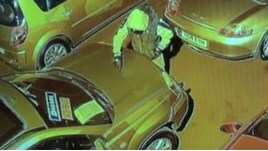 In footage handed to police by Edginton a man can be seen scratching every car in the dealership’s forecourt. The BBC reported that Edginton had said he did not know why he had been targeted. He has handed the CCTV footage to police, who called referred to the incident as a “reckless act of vandalism”.